Unusually for a film by the great master Mizoguchi Kenji, I found Lady Oyû quite difficult to get into. Oddly though, I now find myself thinking about it quite a lot. 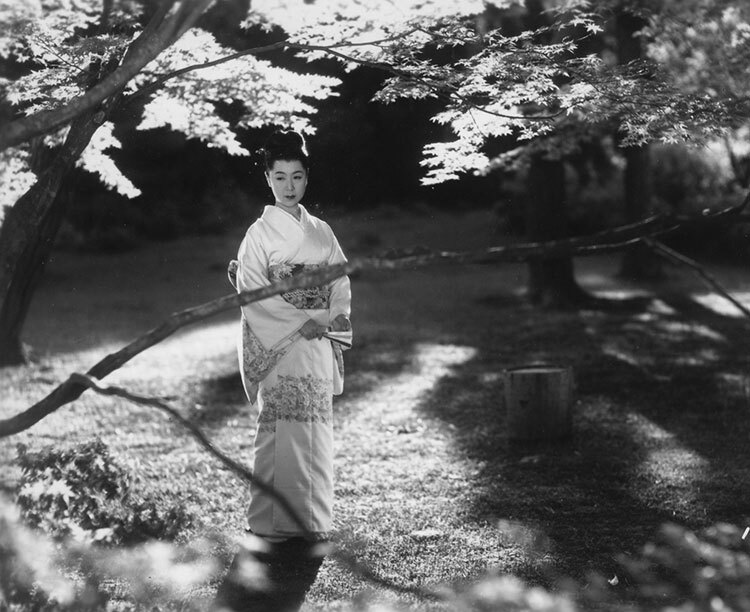 Viewed by many critics to be one of the weakest of Mizoguchi’s films and disowned to some extent by the director himself, it still has much to offer and according to Tadao Sato in Mizoguchi Kenji and the Art of Japanese Cinema “Every single scene [in Lady Oyû] is like viewing a masterpiece of Japanese painting” (2008: 66-7). I would agree with Tadao, especially in relation to the first sequence in the film (from which the still image above is taken), but there are quite a few other issues here. Mizoguchi made three films for three different studios in 1951 and this one was for Daiei, with whom Mizoguchi would have great success overseas in the next few years. (This DVD is one of the twin packs of Mizoguchi Daiei releases from Masters of Cinema.) Mizoguchi was faced with a studio job that was frustrating in several ways. The problems began with the property itself. Lady Oyû is an adaptation of a novella by Tanizaki Junichiro, one of the most important figures in 20th century Japanese literature. The novella appeared in 1932 as The Reed Cutter. It is a ‘tale’ told to a traveller by a reed cutter on a moonlit night. The tale is about a marriage triangle in which a young man goes to a marriage meeting where he falls in love immediately, not with the young woman who has been chosen for him, but with her older widowed sister. The younger sister eventually marries the man, but refuses to consummate the marriage and explains that she agreed to wed in order that the man could be close to the widow (who shouldn’t marry in deference to her in-laws because she is bringing up her small son). The story is about the obsessive love for a beautiful aristocratic woman who is on a pedestal. Mizoguchi was faced with two changes imposed by the studio – the title was changed and the narrative structure of a tale told in flashback was replaced by a linear narrative. The title change seems a commercial decision to draw audience attention to the image of obsession – but it does mean that the images (and songs) which reference the reeds become puzzling. The shift to a linear narrative is more problematic however. My main criticism of the film is that it has three distinct aesthetics which for me don’t blend together. If they had been presented as flashbacks this might not have been such an issue. The three different types of sequence presented in the film are: (i) the formal and highly ritualised meetings which include musical performances as well as the initial marriage meeting and the wedding (ii) interior and more intimate scenes, shot in the studio, involving the three main characters and (iii) location shots by the sea and river bank or in the woods. The mix between studio and location seems quite abrupt and reminded me of many Hollywood films of the 1940s (with some quite unconvincing background shots of railways which I thought might be models). On the other hand, scenes are separated by quite long fades to black. Mizoguchi is best known for two aspects of his work. His wonderfully fluid camera, sometimes adopting a slightly high angle, often follows characters as they move diagonally across the frame. This has been likened to the unrolling of Japanese scroll paintings (emakimono). This camera movement is part of a ‘long take’ style which in more confined spaces becomes translated into what the French call a plan-séquence. In Tadao’s book he offers an anlysis of a single take of 6 minutes and 57 seconds from one of the interior scenes in Lady Oyû. I intend to use this analysis in a class so I’m going to watch it again a few times. The stunning cinematography is the work of Mizoguchi’s long-time collaborator Miyagawa Kazuo. The other well-known aspect of Mizoguchi’s work is his fascination/obsession with the lives of ‘suffering women’. Partly this was connected to his own early life spent with his mother and older sister (who was forced by economic circumstance to become a geisha in order to support the family). In 1946 women in Japan got the vote for the first time as a result of the ‘democratisation’ process set in motion by the Occupation Authorities. Several of Mizoguchi’s films of the period featured protagonists struggling for women’s rights. Some of these films, like Lady Oyû were set in the later Meiji period (i.e. between 1880 and 1910). One was My Love Has Been Burning (1949) starring Tanaka Kinuyo. Tanaka was a major star in Japanese Cinema throughout the 1930s and into the 1960s and since 1940 she had become Mizoguchi’s ‘go to’ star. But as Tony Rayns, in the useful intro to each of the films in this MoC series, points out, she was known as a ‘strong woman’, positively animalistic in her vigourous portrayal of women fighting for what they believed was right. She was therefore not well-cast as a reserved aristocratic beauty – the kind of woman a young man would put on a pedestal and admire from afar. Much as I respect and highly rate Tanaka, I cannot see her as an ethereal beauty. In Lady Oyû her usual star persona comes to the fore in a remarkable scene where she ‘joshes’ and tickles the young man, laughing joyfully and mischievously all the while. While I can see these problems with the film, I’ve enjoyed researching Mizoguchi in this period and I’m now looking for the other films that I’ve not seen made around the same time. Does anyone know of an (English-subtitled) DVD of A Portrait of Madame Yuki (1950) made by Shintoho?